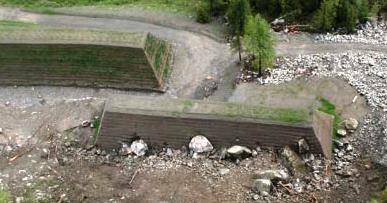 Rockfall protection barriers and embankments are commonplace in mountainous regions. They prevent falling rocks from impacting infrastructure or other assets, causing damage and disruption. Free-standing Maccaferri gabion embankments are a popular solution as they have a natural rock wall appearance and can be designed to withstand multiple impacts without needing repair. A recent project, designed by AECOM, supported by Maccaferri engineers had space constraints; the gabion barrier needed to withstand repeated impacts, yet had to fit into a narrow corridor adjacent to the Great Glen Cycleway in the UK. AECOM’s design included a gabion wall restrained by a number of 22.5te Parafil ropes, built into the gabion wall. Parafil “Type F” ropes are geocomposite materials with a Kevlar tendon core, protected by a polyethylene sheath, offering high strength with low strain. Parafil ropes are manufactured by Linear Composites Ltd, a member of the Maccaferri group. The three Parafil ropes were restrained, on either end of the gabion wall, within concrete anchor blocks. The Parafil reinforcements increase the overall impact capacity of the syste, and reduce its potential to deflect under impact. The design life is predicted to be greater than 100 years.